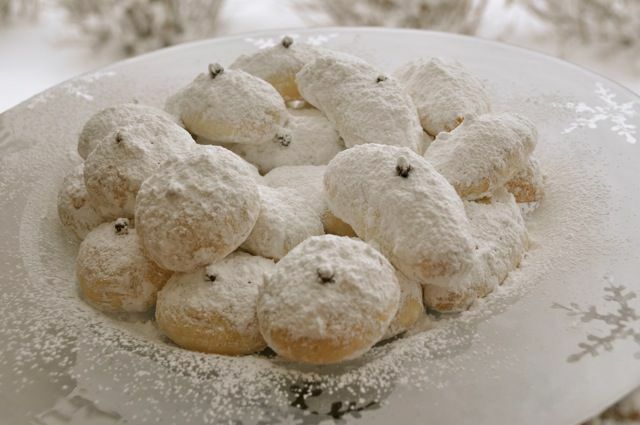 Kourabiethes are celebration cookies: they are prepared at Christmas, baptisms, and weddings. This recipe for these shortbread-type cookies is packed with toasted almonds, includes the taste of cinnamon, and calls for the traditional coating of lots of confectioner's sugar. Dissolve the baking soda in the brandy. Beat the eggs whites and yolk together. In a mixing bowl, beat the butter, oil, and 1 cup of confectioner's sugar until white and light. Beat in eggs, brandy with baking soda, cinnamon, and chopped almonds. Stir in flour and use hands to combine. The dough will be fairly dry and dense. Take a fistful of dough and squeeze 8 times to soften. Shape into balls and flatten slightly to a height of about 1/2 inch and 1 1/2 to 2 inches in diameter. The dough can also be patted to a height of 1/2 inch and cut with a cookie cutter. Place on ungreased cookie sheets and bake at 350°F (175°C) for 20 minutes or until a pale golden color. The cookies may split slightly on top. Allow cookies to cool completely before topping with confectioner's sugar. Sprinkle one or more serving platters with confectioner's sugar. Place one layer of cookies on the platter (carefully, using a spatula) and dust with sugar. (Place sugar in a strainer and tap or shake over the cookies.) Place another layer on top of the first, and sprinkle with the sugar, continuing to no more than three layers on each plate or platter. Be generous with the confectioner's sugar! Variation: To avoid using alcohol, use orange juice instead of brandy. Smaller cookies: A great idea for gifts, kourabiethes can also be made in bite-sized cookies (boukies in Greek, say: book-YES) and given in batches of 6, 12, or other number of your choice. To store: Kourabiethes will keep for several months if stored in airtight containers. Make sure there's a dusting of powdered sugar on the bottom of the container, then layer cookies as above, each layer with a covering of sugar. Wait one day after baking to cover with an airtight lid.